There is nothing cooler than breaking out all your old school vinyl records. Turntables and other record players have always been popular with those interested in listening to their favorite records! These players have become more affordable, convenient, and are even mixing modern technologies with traditional designs. A lot of players incorporate connectivity adapters and other optimizing features. Keep an eye out for easy to use and innovative machines that will match your record playing needs. Features like One Push Play is a simple get started way to familiarize yourself with record player sound. Budget friendly products are also a priority to music lovers looking for the best products at a lower price. Our goal is to give our thoughts and reviews of the best available record player under 200$ and give product information to all those searching for a new turntable. Our search for the user and budget friendly turntables led us to the Pioneer PL-990. The Pioneer PL-990 really surprised us with its sleek, minimalist look. Reviewers are loving its excellent performance and functionality! The Pioneer PL-990 is a standout record player because of its multi-use capability. In addition to providing good sound, it has direct line connectivity and auxiliary input for the built-in phono equalizer. The product is very light, weighing just 5lbs 14 oz and will fit in many places throughout the home. It’s definitely not a large player and will blend in nicely with your other devices. In addition to the design, the first thing you’ll fall in love with is how easy it is to get started and play your records. The Pioneer PL-990 has a fully automatic operation that allows you hands off listening and no extra buttons to tinker with. You can start listening to your favorite music faster and worry less about record player reliability. This turntable has a low-mass straight tone arm that is touted as giving better tracking. The weighted arm is ideal for playing even the oldest and worn records. 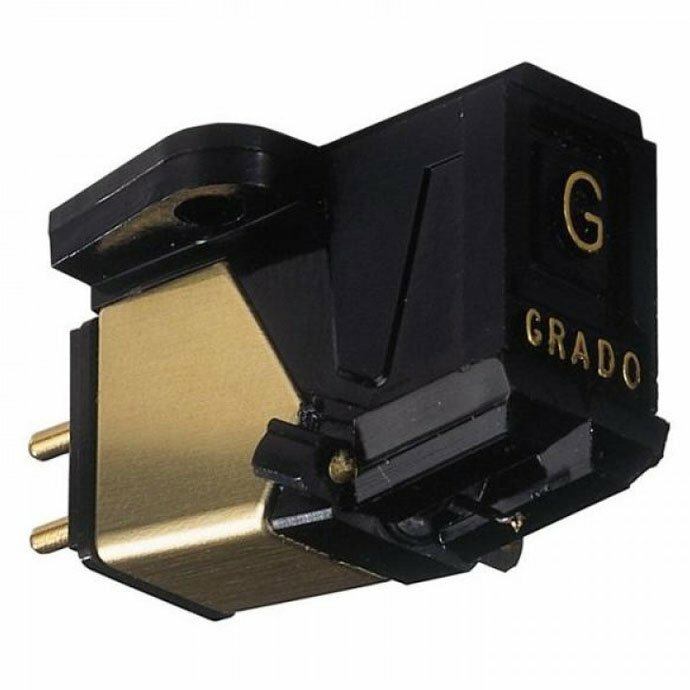 This type of tonearm can be appreciated for its ability to produce high resonance frequency without reinforcements by frequencies from warps and eccentricities. Straight arms offer high mechanical strength and elevated precision. The Pioneer PL-990 really is a great value for the money. 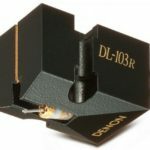 The Pioneer PL-990 has a built in phono equalizer, as well as an universal cartridge connector. The player’s cartridge connector has a moving magnet, diamond stylus, and is universally compatible offering convenience to the user. The dust cover was a smart addition to this turntable and helps keep unwanted dirt, dust, and debris away from the records. We don’t have many critiques with this player. However, you will need to purchase speakers and an amplifier for a complete sound system. 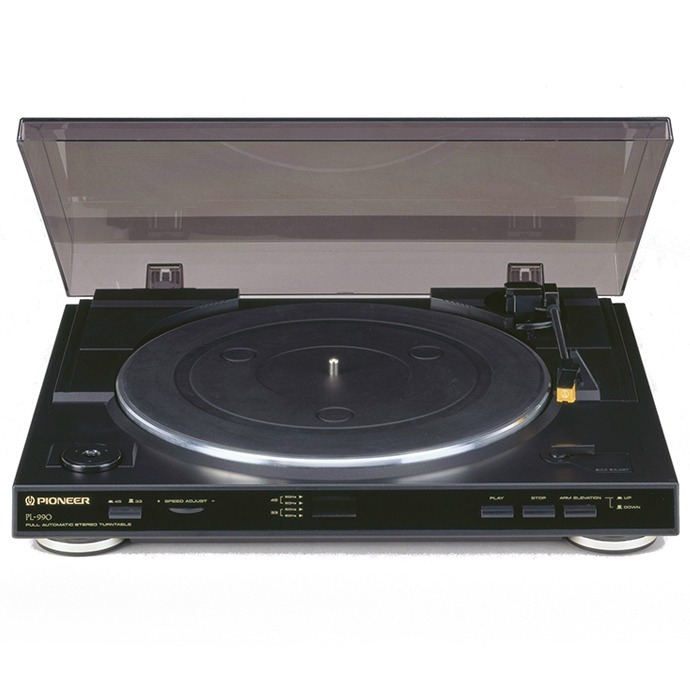 The Pioneer PL-990 is a good choice with proven features and is great record player under 200$. After the Pioneer PL-990 test you will notice the ease of use as a theme throughout your set up. You will also see the incorporated low-mass straight tone arm. This low-mass straight tone arm is there to enhance tracks, it have a resonance resistance and is highly sensitive. One thing we like about low-mass straight tone arms is the low occurrence of mistracking, sturdy design and precise delivery of sound. 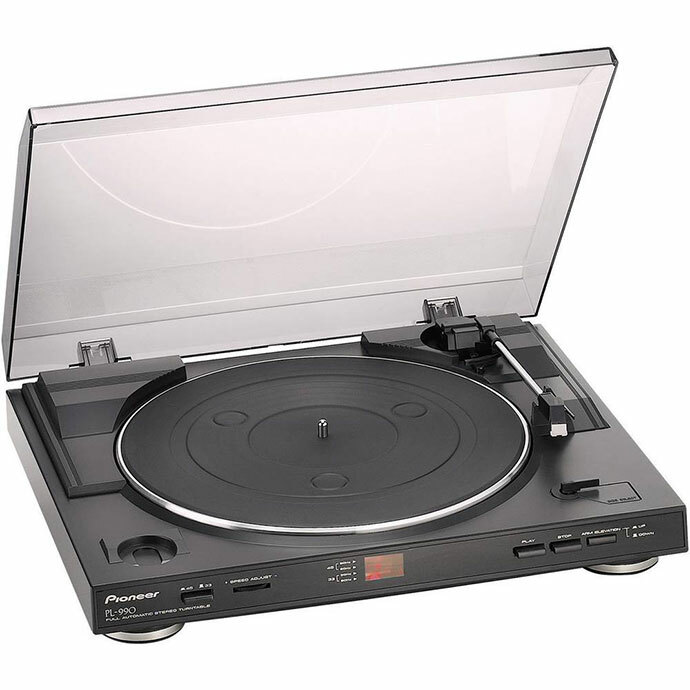 When searching for turntables some other desirable features include: low harmonic distortion, minimal to no tracking error, better channel separation and an overall reduction in distortion. Further testing of this model, Pioneer PL-990, show the precision DC servo motor that gives the machine its drive method and platter rotation for a desirable sound. The Pioneer stable sanging motor works via a spindle wobble that is designed for smoother and more accurate rotation. The DC servo motor and belt drive system has a regulator so sensitive that it can monitor the motor voltage and in turn generates performance improvement in areas like long-term speed drift and static stylus drag sensitivity. Other types of turntable drive methods are available, but the DC servo motor and belt drive system performs and offers an excellent solution to platter rotation needs at an affordable price. 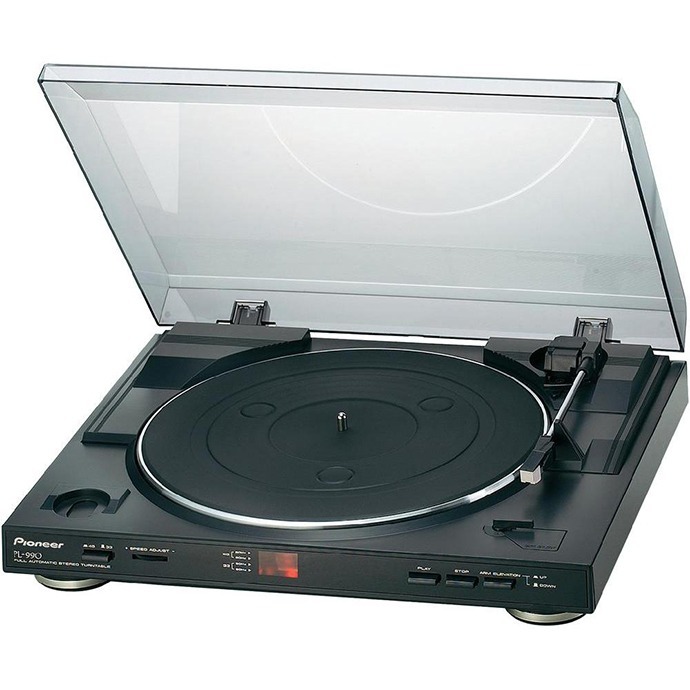 If you want to know where your turntable money is going and what exactly you’ll get when purchasing a Pioneer PL-990 record player, then check the specs. These specifications are impressive for people in the market for turntable under 200$! The Pioneer PL-990 is a fully automatic system with hands off operation. All you need to know about operating the Pioneer PL-990 is how to push a single button, and your record will begin to play quality sound. As a bonus, the turntable will shut off automatically. The player features a low-mass straight tone arm for resonance resistance and better tracking. It weighs 5.1lbs, and the dimensions are 13.9 x 16.5 x 3.9 inches. The light-weight player is made by Pioneer, model #PL-990 and requires one lithium ion battery. This user-friendly machine has two speeds allowing the user to play both LP’s and 45s. Other features include a P-mount cartridge, a universal-type cartridge connector, with a moving magnet cartridge included. Built in phono equalizer makes connectivity simple and lets you hook up auxiliary/line input to your amplifier or mini audio system. The Pioneer’s PL-990 has a Low-vibration belt-drive design, rubber platter mat, and vibration-absorbing feet, all of which contribute to the clean sound and minimal disruption qualities. A hinged dust cover component is a smart feature that is not only useful to keep away unwanted dirt, but also fits in nicely with the sleek design of the PL-990 model. Considering the very affordable price tag, $119.73, the Pioneer PL-990 is a 5-star choice when looking for reliable record players under 200$. Countless reviewers are pleased with the crisp sounds and reduced distortion. Important features of this model help provide a clearer, more natural sound without any muddiness. If you’re just starting to get into vinyl records or have been a fan for decades, the budget friendly turntable that doesn’t cut corners on sound quality, the Pioneer PL-990, may be the smooth sounds you’ve been searching for. Happy listening! If you are not satisfied with this turntable, check another one great turntable under 200 $: Sony PSLX300 USB Stereo Turntable .